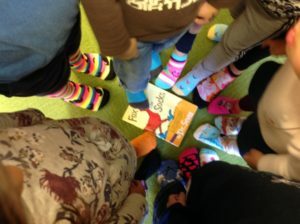 “Crazy Sock Day” in honor of Dr. Seuss’ Fox in Socks. 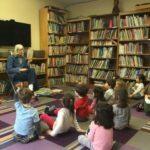 Jan Brett, Dr. Seuss, Andrea Beaty, Leo Lionni, Eric Carle, Karma Wilson, Todd Parr, Mo Willems…what do all of these authors have in common? They have all been featured author study subjects at The International Preschools as part of its play-based learning curriculum. 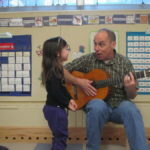 Each year, students at The International Preschools embark on an author study during the months of February and March. The curriculum is approached in different ways, based upon the children’s age level. In the Red Rooms (2s) and Green Rooms (3s), one author is chosen, and a variety of his/her books are read. In the Pre-K (4s) and Junior K (4s/5s), a chapter book is selected by the teachers, and a chapter is read every day in class by parent volunteers. Students created their own valentines for family members at the art table. The topics of love, friendship, and being kind are underlying themes throughout every school year at The International Preschools. In February, the students at The International Preschools bring these concepts to the forefront of their learning by celebrating Valentine’s Day. The teachers at all three locations approached this subject in ways that were both similar and unique. Colors commonly associated with Valentine’s Day (red, pink, purple) popped up in many classrooms. In fact, many of our Red Rooms (2s) used this opportunity to begin their color units. Children were invited to wear red, pink, and purple to school on Valentine’s Day, and some classes also held a show-and-share of red items. The “heart” shape was also used as a symbol of Valentine’s Day and love; in one classroom, students learned about the heart muscle and became versed in how to take their own pulses! Some children built on their letter acquisition skills by learning to spell Valentine’s Day-related phrases! To further the concept of friendship and working together, many students participated in whole-group projects such as collaborative collages to promote the idea of functioning as a team. 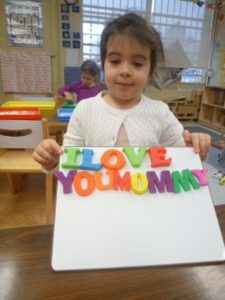 Many classroom writing centers provided older children with the tools to make their own valentines, including word boxes (with Valentine’s Day-related words and phrases for children to reproduce, such as “I Love You”), markers, crayons, pencils, paper, and scissors. 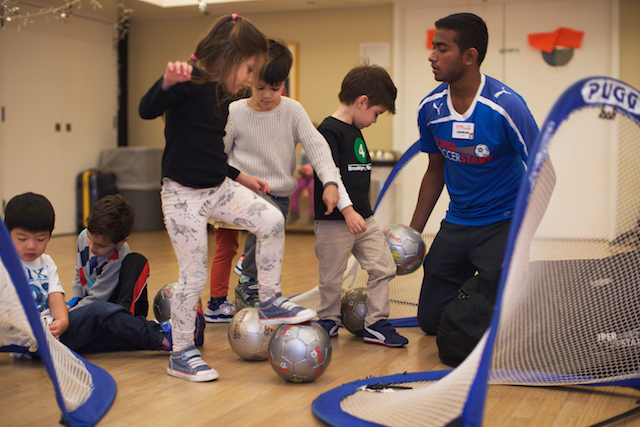 This type of open-ended activity allows for students to work at their own ability level, the common goal being that the “process” is more important than the final “product, thereby reinforcing the school learning through play philosophy. We at The International Preschools wish you and your family a very Happy Valentine’s Day! To purchase any of the books above, while also supporting our school, click here. To learn more about our school, visit our admissions pages, including a letter from our director, click here. The International Preschools is excited to announce two brand-new iPad curriculum initiatives that incorporate play-based learning with technology. In February, the Pre-K and Junior K classes will be introduced to Bee-Bots and iStopMotion. The Winter Solstice celebrations at The International Preschools have long been a tradition to welcome and honor the longest night of the year and the diverse holidays celebrated by our families. Each location hosts an all-school Sing-Along, followed by individual classroom potlucks. 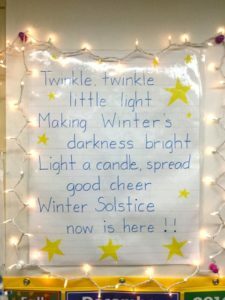 December holidays celebrated around the world are feasts and festivals of light; our students explore the concepts of “light” and “dark” to delve into these themes via play-based learning. 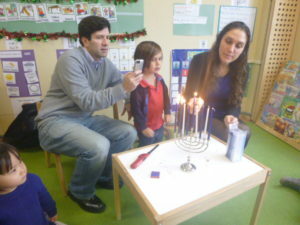 An IPS family taught a three-year-old class about Hanukkah, a festival of light. 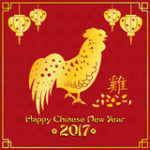 Each year, The International Preschools’ community celebrates the holiday season through an observance of the Winter Solstice. The Winter Solstice is the longest night of the year, with the fewest hours of light. Many of the international holidays during this time of year celebrate the concept of light; the commemoration of the Winter Solstice at our school acts as a way to collectively celebrate many family and holiday traditions.